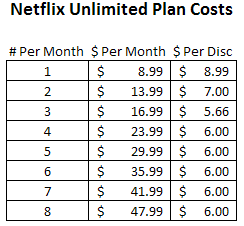 Their signature plan is the 3-out-at-a-time so they are keeping it pretty cheap at $16.99/month to compete with Blockbuster’s $16/month but the extra for the 4th, 5th or more out at a time are relatively costly for the convenience. You’ll note the per disc cost is actually highest for one-out-at-a-time (the one I’m using). And still high for 2, but 3-out-at-a-time is extremely low in comparison. The thought is, most of us will take a while to return movies. And the more you have the longer it takes to watch them right? So Netflix is counting on those with the 3, 4 and more plans will cost them less just because those extra discs will just sit waiting to be watched where those like me with my one disc are more likely to watch, return and repeat meaning quicker turnaround and more postage. Strange logic, but it probably works out that way. I used to be a pretty heavy user, but don’t have the time to watch movies as much as I used to. So these days I’m on the 1-out-at-a-time and supplement the urge for an instant movie with Redbox and the watch-now feature that comes with my Netflix subscription. I was a little surprised with the Consumerist article linked to my somewhat dated (2007) article titled: “Beat Netflix Throttle - 7 Steps to Getting the Netflix Movie You Want” because I’m just not a heavy user anymore and as such haven’t had any trouble getting the movies I want. I do definitely order new releases for delivery Tuesday which works 99% of the time except for the occasional Blu-Ray. 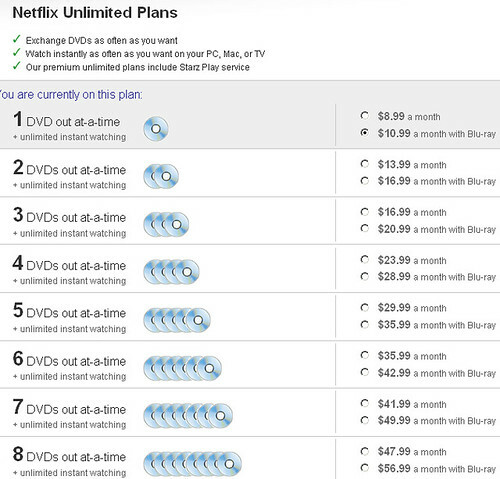 If you’re using Netflix what plan are you on? How fast are you at returning your movies to Netflix?